In honor of Andersonville Restaurant Week, I made a trip to Appellation – a wine bar & bistro in the heart of Andersonville. This was my first time dining here and it’s safe to say that I’ll definitely be back! The ambiance inside the restaurant was very cozy and welcoming and I felt almost like I was dining in the comfort of my own home – if I had a full wine bar, wait staff, and personal chef. I arrived with a friend around 7 PM on a Sunday evening and we were both ready to dive into the menu. In addition to the Restaurant Week menu, there was also a fondue special that night – $15 for cheese fondue served with apples, meat, pickled vegetables, and french bread. Obviously, we went with the fondue – and it was a choice well made. Appellation is a wine bar and naturally we needed wine with this adventure. The beverage list is FOUR full pages long, but after much deliberation we decided on a bottle of Bourgogne Rouge – a Pinot Noir. The Restaurant Week menu allows guests to choose [from select dishes] one starter, one entree, and one appetizer – all for $30. Since the cheese fondue was a decent serving size, we decided to just split a Restaurant Week selection. Our choices were: Brussel sprouts for the starter, braised pork shoulder for the entrée, and Gouda brownie for dessert. The Brussel sprouts were served with leek ash ricotta, picked cherries, apples, and pistachios. I am a HUGE fan of Brussel sprouts – always & forever – and these were some of the best I’ve had in a while. They also were perfect for dipping into the cheese fondue! This pork shoulder, y’all…I’m honestly not a huge pork fan, but this was SO tender and had amazing flavor. It was served on top of a cauliflower purée and topped with spicey soy mushrooms and a pomegranate reduction. If you’ve read my most recent blog post you know that I’ve given up meat – but this pork shoulder was well worth breaking that solemn vow. Last, but certainly not least, was my favorite part of the meal…that Gouda brownie. As a brownie purist I was a bit skeptical at first, but I was pleasantly surprised with how delicious this brownie was. The brownie was a little crunchy on the outside, but soft on the inside – just how I like it – and topped with a 5 year Gouda caramel sauce and whipped cream. I’ll be honest and say that I housed this dessert – not leaving much to be shared. All in all, I really enjoyed Appellation and was glad to discover such a cozy spot tucked away in Andersonville! Andersonville Restaurant Week is live and in full effect until Sunday, March 4th, so be sure to get out there and find your new favorite spot in Andersonville! p.s. – have you joined the exclusive G&G club?! Ok it isn’t really that exclusive, but you should still join my mailing list to be sure that you don’t miss any posts! I share a weekly newsletter with tons of fun content – so what are you waiting for? I had a great time dining at Appellation for this sponsored post! 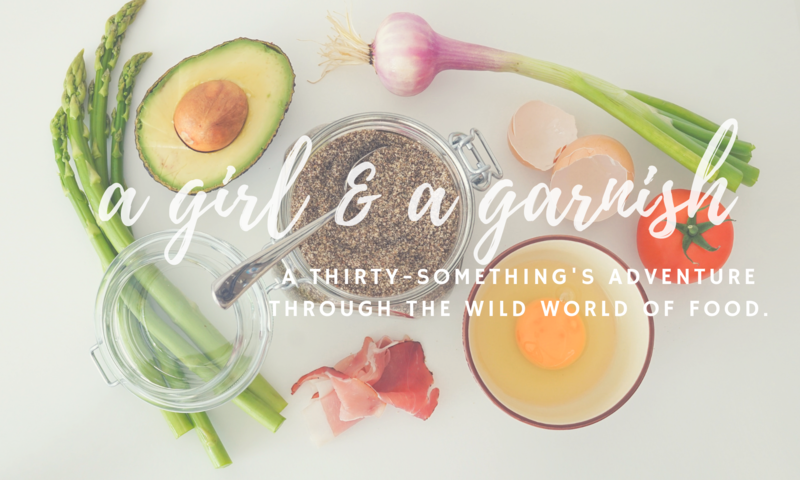 Previous PostPrevious A Girl & A Garnish Turns 3!